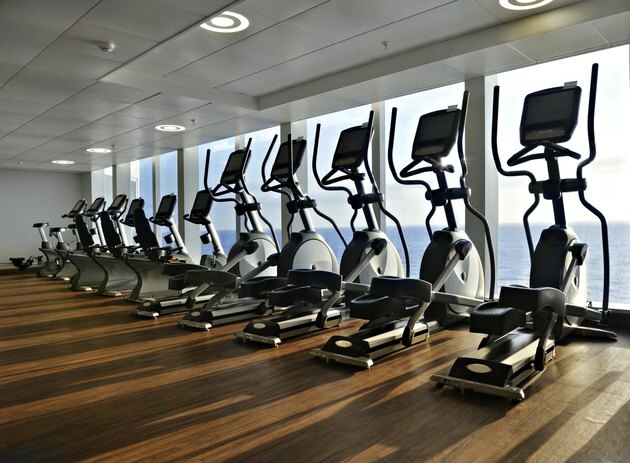 Elliptical machines offer a form of low-impact aerobic exercise. They cause less stress on joints and muscles than jogging or running, even on a treadmill. In addition, many models also work the arms and upper body with moving handles. While elliptical machines are designed to provide a thorough, effective cardiovascular workout, you'll achieve the most health benefits by pushing yourself hard enough to achieve your target heart rate. Check periodically to see whether you've reached and are maintaining a good pulse rate. A basic formula identifies a range in which your pulse should remain to get the best possible cardiovascular elliptical machine workout. First, identify your maximum heart rate. If you are a man, subtract your age in years from 220. The maximum heart rate for a 40-year-old man would be 220 minus 40, or 180. If you are a woman, your maximum heart rate is 206 minus 88 percent of your age. A 40-year-old woman would multiply .88 times 40 to get 35.2. Subtracting that from 206 would yield a maximum heart rate of 170.8. Your target pulse rate is anywhere from 50 to 85 percent of the maximum heart rate value. Find these numbers by multiplying your maximum heart rate by 0.50 and by 0.85. For example, if you are 40-year-old man with a maximum heart rate of 180 beats per minute, a good pulse rate for you while working out on an elliptical machine is between 90 and 153 beats per minute. A pulse rate between 50 and 85 percent of your maximum heart rate is obviously a broad window, within which every individual has a more specific target range. In general, the newer you are to exercising, the lower in this range you should remain while exercising on the elliptical machine. If you're not physically fit, you can overexert yourself, putting yourself at risk of injury and even a heart attack. Consult your physician for personalized guidance on a good pulse rate to achieve while working out and advice on how to safely build up to that rate. Only your doctor can consider your overall fitness, health conditions, prescriptions and other important factors to determine a safe target pulse rate. A lot of people make the mistake of counting their pulse while continuing their aerobic exercise. As the Cleveland Clinic advises, briefly cease exercising and stand still to get an accurate measurement. Don't worry, your pulse rate won't drop significantly during this short pause. Lay your index and middle finger on the underside of the opposite wrist, about a finger's width below the base of your thumb. Alternatively, find your carotid pulse with these fingers along your windpipe beneath your jaw. With a watch, time 10 seconds, counting every beat of your pulse. Multiply the final count by six to arrive at the number of beats per minute as you immediately resume your exercise on the elliptical machine. The American College of Sports Medicine suggests that healthy adults get at least half an hour of moderately intense aerobic exercise five times a week, or at least 20 minutes of intense aerobic exercise three times a week. However, as with your personal target pulse rate, how often and how long you use the elliptical machine is a matter best decided by your physician. In addition, it's preferable to vary the types of exercise you get from day to day so you work different areas of your body and stave off boredom with your routine. Make the elliptical machine one part of a larger cardiovascular regimen.